It is striking how poorly UKIP do in this analysis in terms of likely number of seats. Despite being expected to get 10% of the national vote, they only win one seat! 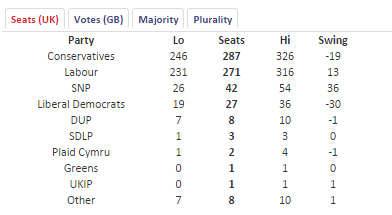 The SNP on the other hand are expected to get just 3.4% of the national vote, but for that to translate into 42 seats! First past the post voting can give some bizarre outcomes. I am currently holidaying in Germany, where there has been a long (modern) history of coalition governments. Indeed the current arrangement is a “Grand Coalition” of the two major parties, the CDU and SDP (equivalently the Conservatives and Labour in the UK). Could the UK political parities ever agree to such a grand coalition? It’s never happened outside of wartime, I don’t expect it will in 2015. Does any of this matter for markets? There are plenty who think that the uncertainty will negatively hit sterling. If it takes weeks rather than days for some sort of coalition to be agreed, then it seems reasonable to expect a hit to confidence. In terms of my own trades, that is a risk to my view on short sterling (see here), but I think a manageable given the type of trade. For all the rhetoric, I’m not sure the platforms of the major parties are sufficiently different to have a meaningfully different economic outcome. Sadly neither are spending enough time talking about the supply-side reforms needed in the UK to boost productivity growth. The bookies have david Cameron as next prime minister.